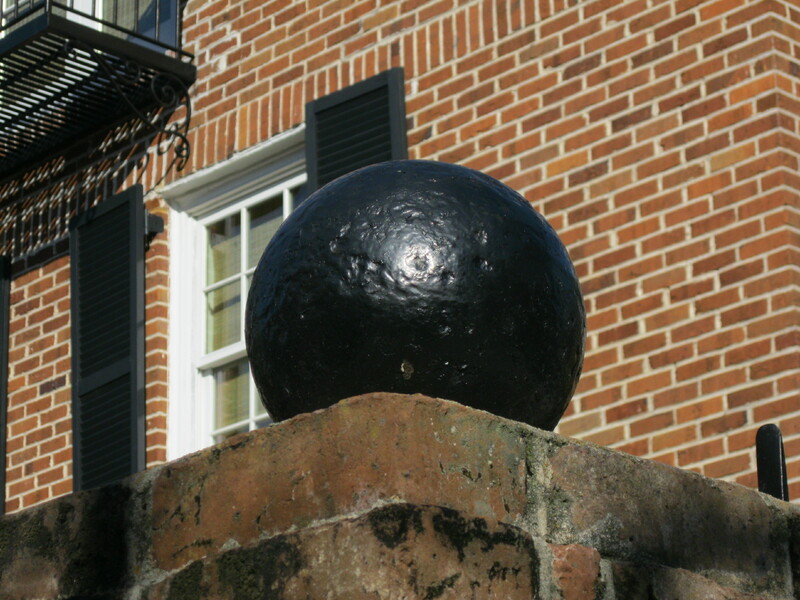 It’s not unusual to see cannonballs and other ordnance decorating Charleston locations, because there is certainly more where that came from. The city has twice been subjected to bombardment from besieging troops – in 1780 by the British, and from 1863-65 by Federal troops in the #Civil War. Contrary to the popular conception that these balls, shot and shells were fired into the city by ships, by far the largest amount came from land-based guns. Ship cannons in historic times rarely had the ability to be angled high enough to fired great distances, whereas land guns could easily be set at a trajectory that allowed great range. The British did fire into the city from ships that came very close to the peninsula, but they also used guns placed at land approaches to a city they had surrounded by 1780. Some of the British guns were placed West of the Ashley River, about were the neighborhood of Moreland is today, and launched both explosive balls and solid shot at patriot fortifications. Just last year, a 22-pound solid ball was unearthed on Savage Street, which would have been the western line of American defenses during the Revolution. 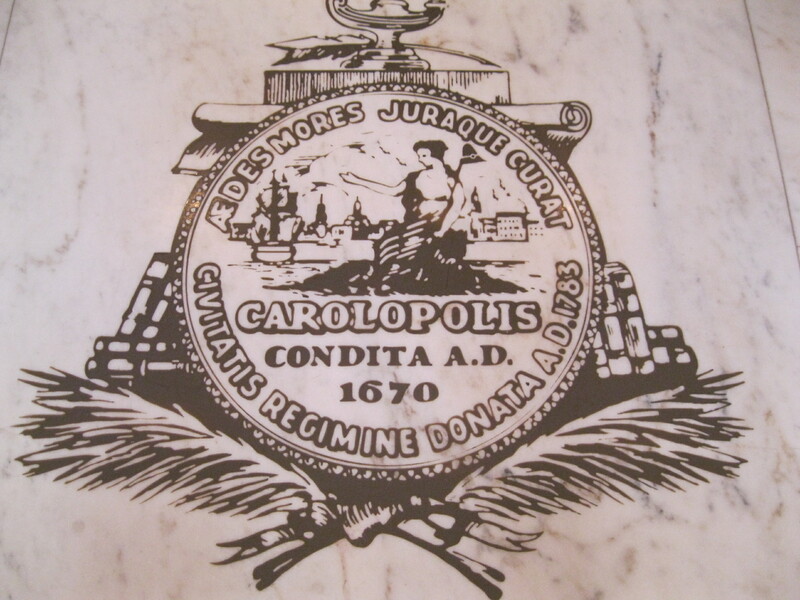 The official seal of the city of Charleston is very interesting and often misinterpreted. The seal shows the Greek goddess Athena standing symbolically as the protector of Charleston, depicted behind her. Athena was recognized as the goddess of the city or town in the ancient Greek world, and much of Charleston’s symbolism in architecture and sayings comes from ancient Rome and Greece. Above her is the city motto, “Aedes Mores Juraque Curat”, meaning “She guards her buildings, customs and laws”, referring to Athena symbolically representing the city in protecting its own. 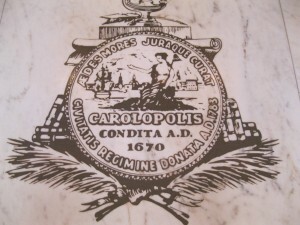 Beneath her, the term “Carolopolis” is a combination of Latin and Greek, “Carolus” is Latin for Charles, for whom the city was named, and “polis” is town in Greek, the combined meaning “Charleston”. “Condita AD 1670” refers to the founding of the city, as “Condita Anno Domini” is “established in the year of our Lord” in Latin. Below that is the term “Civitatis Regimine Donata AD 1783”, meaning in Latin “Given to the city government in 1783”, referring to the official incorporation of the city after the Revolution. Finally, at bottom and surrounding the seal are books, scroll, quill, lamp, and palmetto leaves, representing the wisdom and legality of the city government, as well as its openess to other as shown by the palms, which were a symbol of welcome in the ancient world. This seal is in the main hall of City Hall, carved in the stone floor. I often take visitors there on the walking tours. Many of historic Charleston’s most picturesque balconies are additions to houses that had been built long before. The corbel-based balcony pictured here was added to this 18th century house as a Italianate detail popular in America in the mid-19th century. Although we are much better know for the famous “piazzas” that come from earlier Italian architectural details, the balcony is also Italian, at least in name, which comes from the Italian “balcone”, meaning “scaffold”. 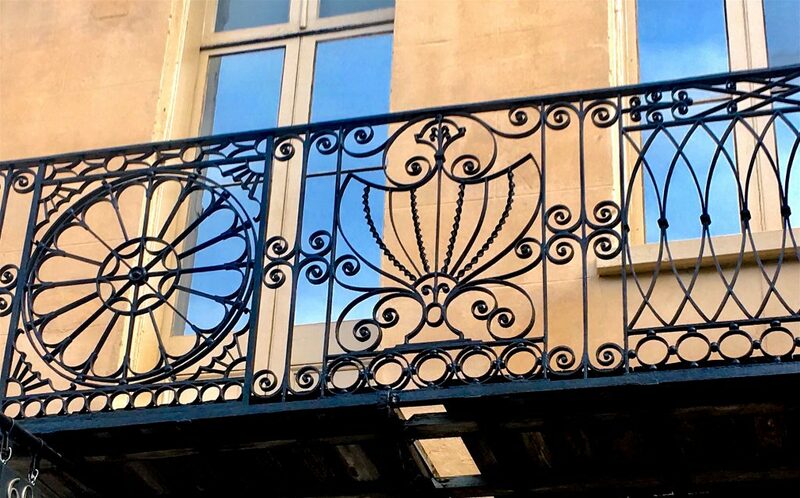 One of the most interesting stories involving balconies is often told about the cast iron version at 78 Church Street, where George Washington was said to have delivered a speech during his 1791 visit to the city. The story is based on a first-hand account of Washington’s visit, but confuses the location from a reference to his “observing the crowd from a balcony at Church”, (not Church Street). This was obviously a reference to the open section of St. Michael’s, which is correctly a lantern, not balcony, but would seem the same from that perch above Broad Street, and at a location Washington was known to have visited for services, so a crowd would have surely congregated below. Oh, one more thing, the decorative cast iron balcony was also not popular in America until the Italianate era, so it was not even there when George was. Perhaps the most exquisitely-detailed i exterior in Charleston can be found at the Isaac Jenkins Mikell house on Rutledge Avenue. Built in 1853 by Mikell, and Edisto Island planter, the house at that time overlooked the Ashley River. 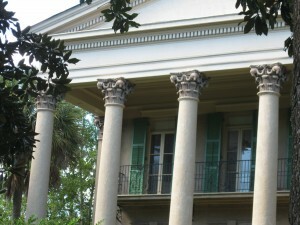 This period in antebellum Charleston represented the epitome of the city’s architectural elegance, and Mikell chose to build a massive side-hall single house Roman Revival style, not Greek Revival as is commonly stated. Most noteworthy of the details built into the house is the elegant piazza, with its distinctive column capitals decorated with two rows of Acanthus leaves below rams’ heads. This style has been erroneously called “Tower of the Winds”, which it is not. This style of capital is called the Composite Order, and was patterned after the famous Arch of Septimus Severus in Rome. Rams and Bulls were common motifs in Roman architecture, representing animal sacrifices to the gods. The “Tower of the Winds” comes from a Greek motif near the Acropolis in which the capitals feature a row of acanthus leaves below a row of palm leaves. The gates to the Mikell house were done by the famous German-born ironsmith Christopher Werner, and are some of the most ornate examples of this talented ironsmith, whose work seems to be forgotten in the recent obsession over the ironwork of modern craftsmen. Certain trends in conveying Charleston’s history are erroneous and need correcting. 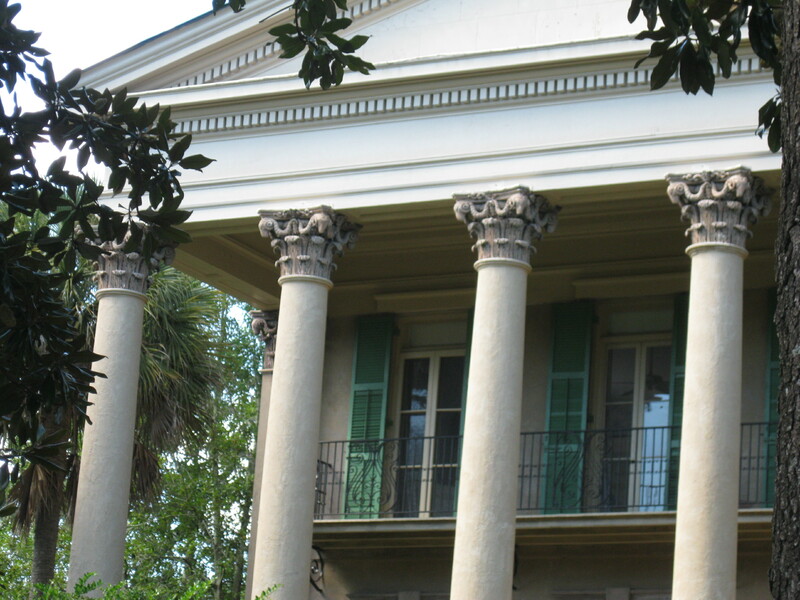 One is that the Mikell house is Roman Revival with columns featuring the Composite order, and the other is that the house’s gates were done by the Christopher Werner, who, despite the attention paid to others, was most likely the greatest of all Charleston ironsmiths. John C. Calhoun’s grave in St. Philip’s Episcopal Church western cemetery is the source of many a unique historic legend and mystery. 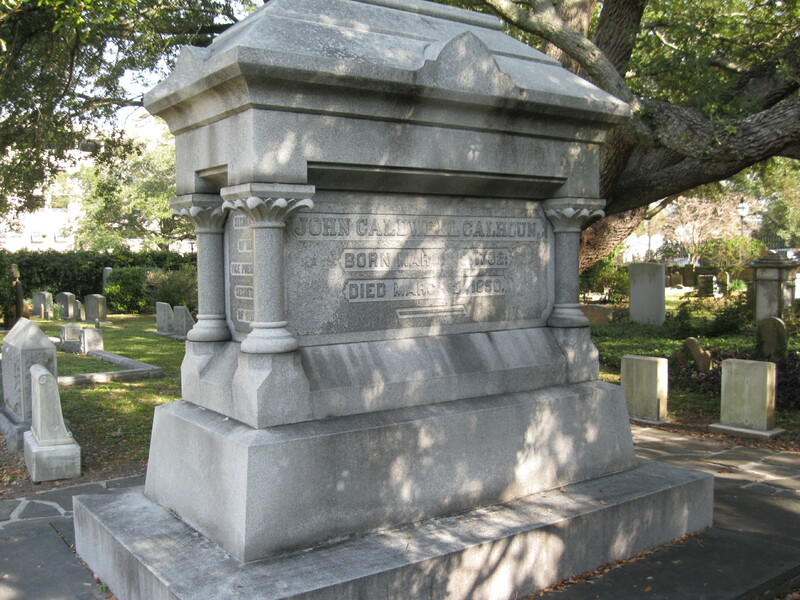 Calhoun, who was born in Abbeville, South Carolina, was buried at St. Philip’s in 1850, despite the fact that he was a Calvinist who attended the Huguenot Church when in Charleston. Calhoun died in Washington DC, and was initially buried there, but was exhumed and returned to Charleston with a grand funeral parade and was buried in the western, or “stranger’s graveyard”, which got its nickname from a 1760’s decision by the congregation to set aside a section for those who died here while on visits or business – because in those days they didn’t ship the bodies home. This adds to the flavor of a curious incident during the Civil War, when Calhoun’s body was exhumed and placed in an unmarked part of the eastern graveyard as a precaution against desecration by Union troops. Known as the “friendly graveyard”, from the legend that this part is reserved for members of the congregation born in Charleston, the eastern side would only hold Calhoun until after the war, when, again according to legend, it was decided the man from Abbeville should be in with the “strangers”. In the 1880’s, Calhoun’s body was moved again to its current site and the massive monument that bears his name. In the 1960’s, there was a rumor that Calhoun had been dug up again, this time by a group called STORCH, “striving to return Calhoun home”, who wanted him to join his wife Floride at her grave site in the upstate. Probes were made and the grave proved to be undisturbed, but poor old John C. Calhoun may not be completely at rest, considering how much fuss has been made over moving and locating his grave.